This, my friends, is a veritable rogues gallery of bad cameras. When I was little and I began collecting, I used to buy these because they were super cheap. It didn't take too long before I began to realize how execrable they truly were. The problem is that they were Ford Model T's in the rocket age. They would have been acceptable in the Depression, but by now they're beyond obsolete. Kodak made a lot of quality equipment, but making this stuff tarnished their reputation; if you bought one of these things, would you trust them when it was time to buy something expensive? 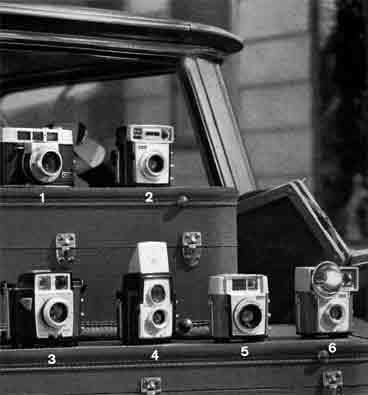 A lot of these cameras are still found in their original boxes with all their papers and accessories, virtually untouched. That's no surprise. The bitterest pill is that most of these turkeys take 620 film, which is no longer being made. That makes them undesirable even among the Diana/Holga/toy camera crowd who would worship these things if they took 120.